Further to what you say - if passengers got on at sydenham gate - they could also have got off at sydenham gate - a round trip - controled decent and forced back up the incline. Again who knows its just a possibility - but I do believe the whole system was operated from the penge end. again the forum`s work on london canals is also great. "Falkor" needs to return to the forum, for all his good input, or is he now called Gone. peter coppin wrote: ...if passengers got on at sydenham gate - they could also have got off at sydenham gate - a round trip - controled decent and forced back up the incline. Every contemporary account, and almost every subsequent analysis, maintains that the departure station was at the Sydenham Gate, and that the carriage was blown along an air-tight tube towards the Penge Gate and then sucked back towards the Sydenham Gate. There was only one stationary engine at the Sydenham Gate and there may not even have been a station at the Penge Gate end. To challenge these often contemporary accounts you need strong evidence, not speculation. speculation (however fanciful) + hard evidence =working theory. I think all the evidence points to some version of Steve's route. ....and as much as I try, I cant see more than one station....at the Sydenham end....I do think the cutting is part of the trench that contained the tunnel...probably dug back when the area was re landscaped. I think we all wish there was a 'missing link' of evidence that would finally solve the mystery..
Physics say going up the incline with the carriage being pushed air has to be expeled in front of the carriage. Going down the incline under its own weight the air in front of the carriage has to be expeled and I read this into the ILN article where the parcial vaccume caused behind the carriage needs to have air bleed into it. I believe steve and wills routes are about right - cant see in the ILN artical where it says passengers got on at sydenham. I believe the physics state the engine house was at the penge end and carriage was pushed up hill - now need push it down hill. To use this movement of air (pressure or vaccume) the grated opening in the floor? must have been a large pipe underground conecting to the engine house - should we not get time team intrested - with there geo-phyisics. More over in victorian times, were not pump houses which pumped water called pump houses - therefore could it not be the engine house is what it says. Again the author of the article was possibly not an engineer and did not understand the physics but was a good observer, hence the artical. All reports and descriptions published at the time centre on the "departure station" at the Sydenham end, with no mention at all of a station at the Armoury. Therefore is it possible that the carriage simply reached the end of the track then reversed? Furthermore, the "Lower Engine House" was matched by an "Intermediate Engine House" beside the intermediate reservoir (now the angling pond) and there was another engine house beside the North Tower, next to the main reservoir. Surely that is fairly conclusive proof that the engine houses provided power to raise water for the fountains rather than for the pneumatic train. 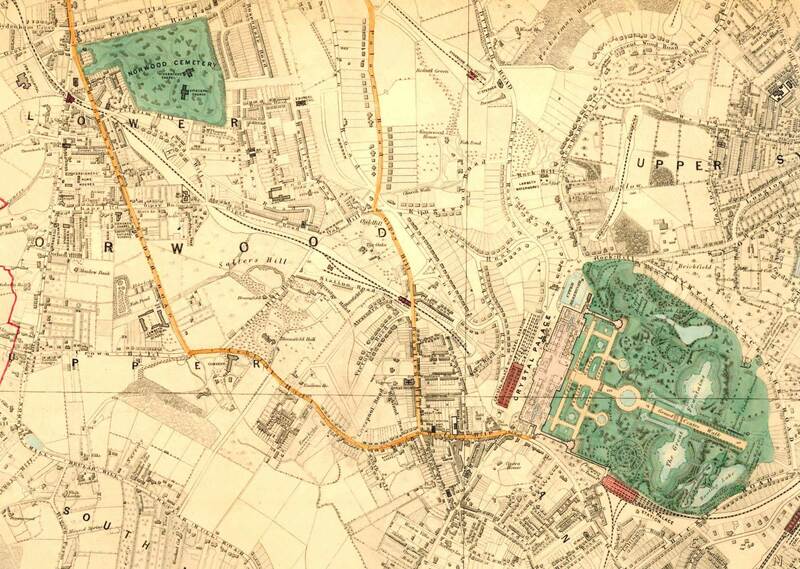 does anyone know of any photos of Lawrie Park Avenue or the Sydenham gate, contemporary with this railway? ...perhaps some photo enhancement might reveal the station or other structure in the background.. I think thats about the only way of bringing new evidence to the table. I bow to both steve and will's knowledge of the history of sydenham and the palace. I accept what steve says about the engine house`s. I also accept that passengers were advised to arive at the sydenham gate. But being a pain, I still go with the physics of the engineering and believe the carriage was pushed up an incline of 1 in 15 about a 6% - not that steep. and reversed back down under its own steam. if the power plant for the railway was at the penge end very noisey and smokey - perhaps the pasengers got on at the sydenham end reversed down to the penge end and were pushed back up to the sydenham end. Who knows - I'll go with the physics and hope time team will solve the problem some day. Thanks to all for the intresting debate thus far. Being a pain again the times advert says visitors in carriages should drive to the sydenham gate - so do foot passengers go to the penge gate. Sorry to keep on I'll stop before I P to many people off. its often an outlandish new theory that shakes up the status quo and leads to he truth. keep that imagination flowing, mate. the unmarked embankment in the 1860s\70s OS maps possibly shows up in a couple of 1919 and 1938 OS Maps, however they both actually seem to form this rather strange line that loops round in strange shape so it is possibly something else, very strange anyway. Someone was asking about this on the Sydenham Facebook page. It shows the palace intact but the houses along Crystal palace Park Road. Part of the palace had burnt down by 1866. The John Norton designed houses along CPPRoad were developed from 1871. Konqi, your map links are broken (if you still look at this). I'd say any trace of the railway is long gone, but where were those original pictures taken that Falkor posted at the beginning of this thread? there could be any number of reasons why there is this discrepancy. Maybe they added the houses and didn't alter the Palace because at that stage they might have said/assumed that the North Transept would be rebuilt? True, but the Aquarium was built on the site of the North Transcript in 1870, a year before the houses were built. The map shows the old roof of the lower station but it doesn't seem to show the maze, which should have been in the park by the time the map was drawn. Can I refer you to http://www.xenophon.org.uk/rammell.html !